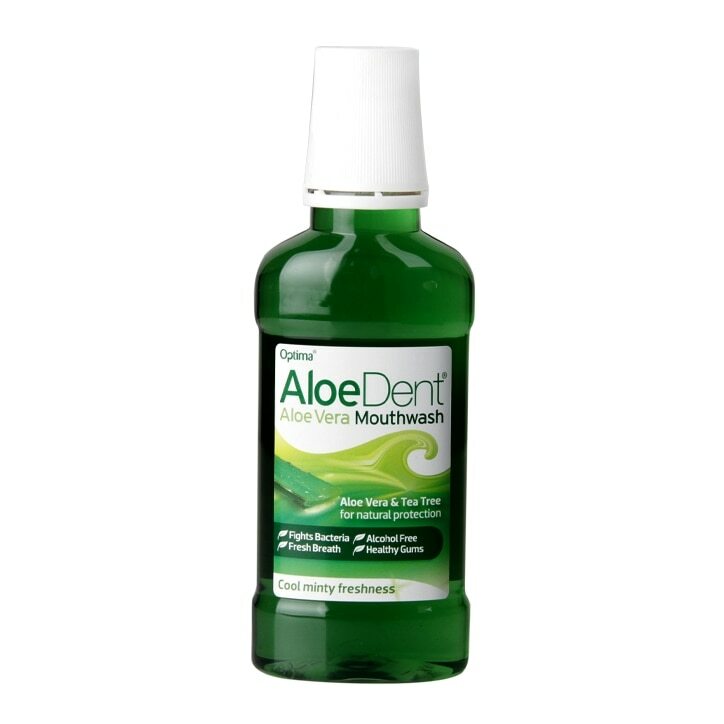 Aloe Dent Mouthwash offers natural oral hygienic protection for the whole family. It cleans, protects and freshens breath with its blend of all-natural ingredients including peppermint oil, menthol and tea tree essential oil. Use it daily after brushing, to cleanse the mouth and teeth after eating, or whenever you want to feel fresh. Its clean minty taste is all thanks to nature's powerful ingredients. There's no alcohol or saccharin in Aloe Dent. Fill cap, rinse around mouth thoroughly and spit out. Aqua, Aloe Barbadensis, Sorbitol, Polysorbate 20, Citrus Grandis Seed Extract, Mentha Piperita Oil, Sodium Lauroyl Sarcosinate, Aroma, Menthol, Melaleuca Alternifolia Oil, Escin, Centella Asiatica Extract, Xylitol, Sodium Hydroxymethylglycinate, Citric Acid, CI75810 (Chlorophyllin-Copper Complex) , Limonene & Linalool (Natural constituent of essential oils). Aloe Dent Mouthwash is rated 4.5 out of 5 by 22. Rated 4 out of 5 by JILForever from OK Mouthwash This mouthwash is godo, leaves my mouth feeling tingly fresh. Rated 1 out of 5 by SerenaMilan from Strong Taste first time I have tried this product. Awful taste! I don't know if It's too strong for me or what else... I could not finish the botte. Rated 5 out of 5 by Alibb from Excellent product Excellent product and excellent service all the way through.